Hurricane Sandy is still a Category 1 Hurricane with winds of 75 mph and now off the coast of North Carolina on Sunday night. It will continue on a northerly track before making a sharp left when it is off the coast of our area. 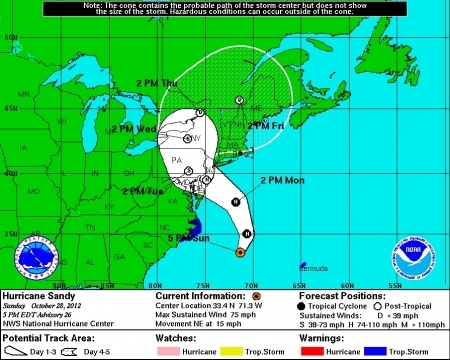 Currently the forecast track has it making landfall somewhere near Atlantic City on Monday night. 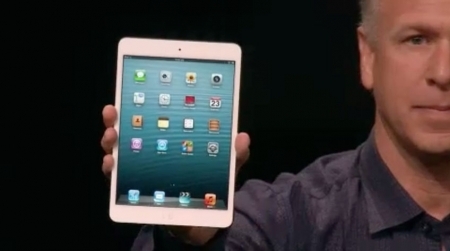 Of course that exact location will be better known the closer the time comes. 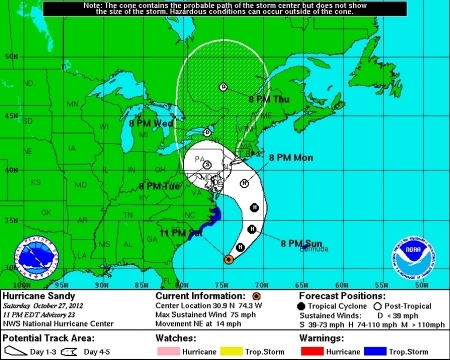 Hurricane Sandy continues up the East Coast, now located off the coast of North Carolina with winds of 75 mph as of Sunday afternoon. All models are in tight agreement that it will make a sharp left once it gets off shore of our area. The models now point to a landfall in New Jersey near Atlantic City. The exact track could shift; there is still time ahead of us and things could change. 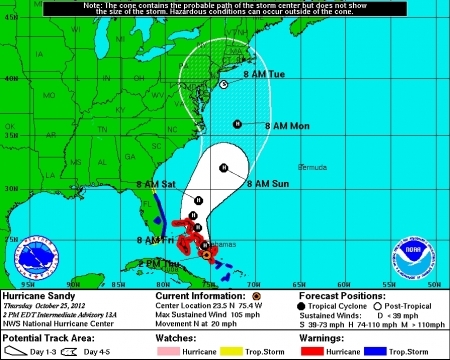 Hurricane Sandy continues to churn up the East Coast, located off the coast of South Carolina with winds of 75 mph as of Saturday night. All models are in tight agreement that it will make a sharp left once it gets off shore of our area. 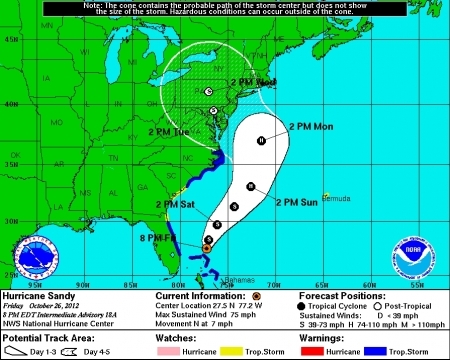 The models now point to a landfall in New Jersey, instead of Delaware Bay as earlier predictions said. The exact track could shift; there are still a couple days ahead of us and things could change, stay tuned. 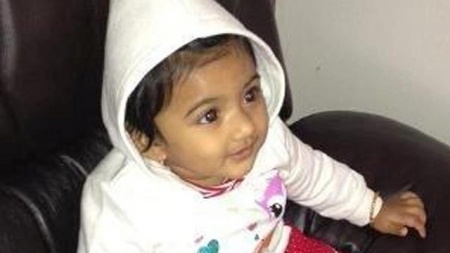 There has been a tragic ending to the search for Saanvi Venna, the 10-month-old baby girl who went missing in King of Prussia. In a press conference this afternoon outside the Upper Merion Township building, the Montgomery County District Attorney's office announced that her body was found at about 4:30 am Friday in a sauna located a bathroom in the basement gymnasium of one of the apartment buildings on the Marquis Apartment complex. 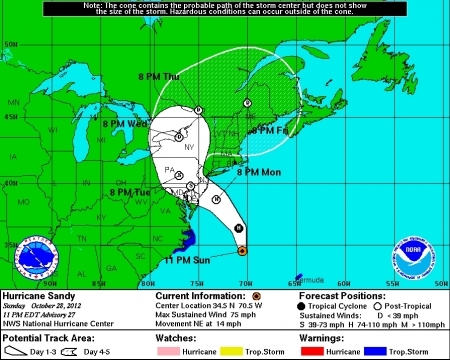 Hybrid Nor'easter/Hurricane Sandy Setting Sights on Philadelphia region for early next week. 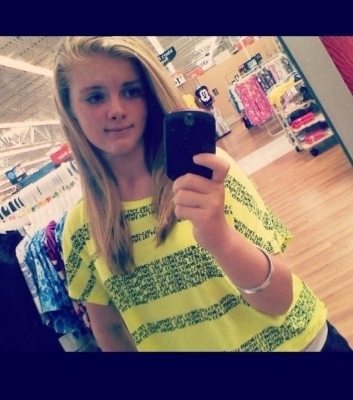 UPDATE 10/25 3pm: They have just raised the reward to $50,000.